B Movies – So BAD, they are SCARY! Giant tarantulas invade your town. What will you do? Run screaming? Throw a gas tank at them? You know you've landed in B-movie land when the insects are as big as Volkswagens or more plentiful than snowflakes in February, when sharks outwit teenagers and crocodiles are being fed cows by Betty White. 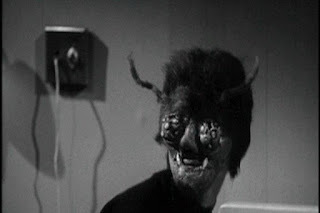 If you know who Roger Corman is, if Ed Wood is your kind of guy, take heart. Our library collection has just what the Mad Doctor ordered. Here are a few to try on for size. - "The picnic is ruined." Plenty of horrible ant scenes, including a laugh out loud scene of ants attacking a kid in a dumpster. Just about every 70's character actor is in this one. If you like bad movies, this one will make you really happy. - William Shatner (aka Captain Kirk) stars in this ridiculous psychotronic spider film. Bad acting, terrible effects, and a lot of crunched spiders make this one truly awful (in a good way). Starring Buster Crabbe and Julie "Emergency" London, this jungle mystery features one of the best ape suits ever seen on film. Extra star given just for the ape's hairdo. An anti-aging beauty treatment goes horribly wrong! This one is classic Roger Corman fare. Must see. An Ed Wood classic. Aliens resurrect dead humans as zombies and vampires to stop human kind from creating the Solaranite (a sort of sun-driven bomb). A strange prehistoric beast lurks in the depths of the Amazonian jungle. A group of scientists try to capture the animal and bring it back to civilization to study. A group of people hide from bloodthirsty zombies in a farmhouse. AVRL has this movie in the "Trio of Terror" DVD set. So many bad movies, how do you choose? Bela Lugosi is the master of the B Movie. Watch for a bookcase door that opens into a secret room – nearly every Lugosi character has one hiding somewhere! Based on a Stephen King story, this is classic stuff from the 80's. The kids are pretty darn creepy. Night Gallery – Rod Serling – Every character actor from the 60's and 70's appears at some point in these great old episodes! Twilight Zone is over, and Mr. Serling needs something to do, so Night Gallery it is. Similar theme—short stories of horror, mystery, and the bizarre. Hours of entertainment! And if that's not enough, use this handy website to help you find more BAD movies! The Port Williams Library will be open extended hours beginning Friday, October 19. The Port Williams Library is located in the Fire Hall/Community Centre on Main Street. The Bookmobile will also be in the parking lot of the Kentville Library from 12-8 on Tuesday, October 23 and Thursday, October 25 to meet our patron's borrowing needs. If you've never been on the Bookmobile, this is your chance! Library patrons are welcome to use any of the other Annapolis Valley Regional Library branches to borrow or return materials – your AVRL card is good at all of our locations. Aside from Port Williams, other nearby branches include Wolfville and Berwick (and both have storytimes, as well) . You can see all of our branch locations and hours here. Library materials can also be returned through the after-hours book return outside the Kentville Library. Thanks to all for your patience and your concern! We will be posting updates on our website, on Facebook, and Twitter. 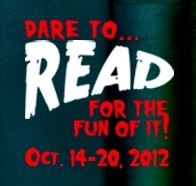 In celebration of Teen Read Week, and to get you in the mood for Halloween, I have some good ghosties to share with you. I've been reading ghost books since I was in High School. Some of the creepiest ghost books I've ever read have to be Anne Rice's "Mayfair Witches" books – featuring vampires, witches, ghosts, and all sorts of bad things that go bump in the night. There's been a resurgence in supernatural YA books, partly attributed to the sensation that Twilight caused, but also, I believe, because a good scare is always in fashion. If you are a casual scary-book reader, these are NOT for you. However, if you like your books to stay with you in your nightmares, dare to read these creepy books! Dreams of the Dead by Thomas Randall – After her mother dies, Kara and her father move to Japan, where he is teaching at a private school. Kara is befriended by Sakura, an outsider whose sister was brutally murdered. Other students begin to disappear, and Kara is having terrible nightmares… or are they real? The setting in Japan helps create the scary atmosphere in this book, which reminded me a little bit of the movie, The Grudge. That scary woman's face kept popping into my head as I read this one! There's a sequel out, too - Spirits of the Noh. 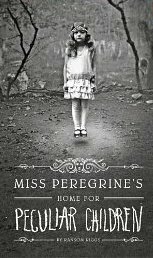 Miss Peregrine's home for peculiar children by Ransom Riggs – When his grandfather dies and leaves him a strange message, Jacob is compelled to discover the meaning. He ends up in a strange house on the coast of Wales, where he meets some peculiar children. The book is haunted by old black and white photographs that were the inspiration for the story. Creepy both in story and visually, this one would make a good read aloud by candle-light. 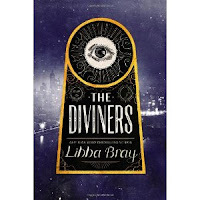 The Diviners by Libba Bray- If you are a regular reader of this column, you might have noticed that I am a bit of a Libba Bray fan. There's a reason for that –she is an awesome writer who seems to have an unlimited imagination. This book has one of the scariest ghosts I've encountered in some time. Meet Evie—a brash girl living in NYC in the roaring 20's. She happens to have a particular talent of being able to read objects – including the buckle from a murdered girl's shoe, which helps lead her to Naughty John—a ghost who has become corporeal and is murdering people. There's a whole cast of characters to love , plenty of humor, a great setting, and a nasty, nasty ghost. This is the first in a series, so stay tuned for further adventures with Evie. 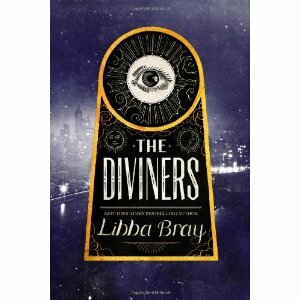 Check out Libba Bray's website for book trailers and other great info on this book. 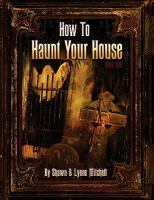 There are lots more creepy books out there, and you can find a few more on this booklist. Some of our branches are hosting Dare to Read book displays for teens this week, click here to see where you can check out a creepy book and enter to win a gift card! I will admit it. Orange and black are my favorite colors. I start to think about Halloween in August and I am the first in line to purchase new Halloween magazines and books that come out in early fall. Yes, I am 40-something and I still love Halloween every bit as much as I did when I was a youngster in the 60's and 70's. The monster that gets my neck hairs tingling is not the high tech digital creation of today, nor the slasher-flick blood and gore type. My monster crawls out of a dusty old crypt with his clothes literally crumbling off him as he hitches along slowly and surely towards his target. He might lose a few body parts along the way but I know in the end he will get me. He looks realistic to me because he is covered with god knows what secret concoction of special effects goo and slime. I can imagine this thing creeping up behind me on a moonlit walk and slipping his slimy skeletal hand around my ankle when I am only a few steps from the safety of my front door. The porch light is shining like a beacon and it is the last thing I will ever see. I won’t be making it home this Halloween. 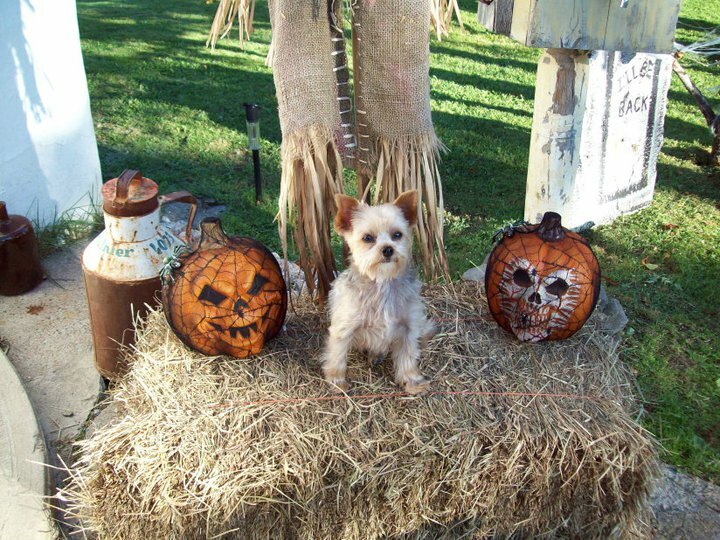 Now that I have set the mood, let’s talk decorations. I love these books! I made a project from Book Three called "coffin dolls". They were fairly easy to make. 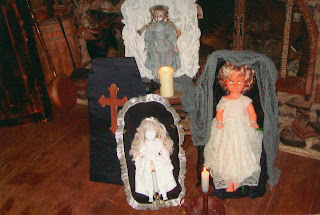 I purchased some old porcelain dolls from a thrift store and painted them with craft paint. The only part I found tricky was making the ruffle for the coffin. I could not figure out how to do this on the sewing machine and had to do it by hand. Getting the right amount of gathers was a challenge for me. I opted for some craft ribbon and a Halloween window drape from Dollarama on the second two coffins instead of making more tricky ruffles. The dolls look really creepy at night. A battery candle or an LED flashlight can be used to light up their faces in the dark.